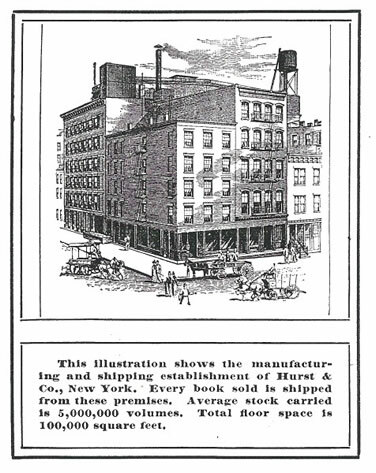 ABOUT: The DLB 49 entry is not detailed but notes: Firm opened in 1871 at 122 Nassau Street; that its plates were leased to Lovell in 1890 but returned in 1893 at which time Hurst sold the Argyle Press to Harris Wolf but continued to publish; located at 135 Grand Street in 1900 [but this seems incorrect as there is some evidence of presence at that location in 1895 and firm evidence by 1897; it may have relocated as part of the 1893 transactions]; in 1902 Reilly & Britton of Chicago took over distribution in the midwest and far west; in 1909 acquired A. C. Gunter Co. and in 1919 is located at 354 Fourth Avenue; Cameo Editions of the Poets sold at $.30, Arlington Editions at $1 (DLB 49). PW 1897 Christmas Bookshelf ad places firm at 135 Grand Street. This view of the Hurst building is from its catalog in PTLA 1911, therefore showing 135 Grand Street. Thomas D. Hurst, an electrotyper, began this firm in 1871 by reprinting books in his shop on Nassau Street, in New York. Like Worthington, his specialty was clothbound standards in twelvemo, and he was among the first to make this kind of low-priced popular book. From his Argyle Press, which turned out books bearing his imprint, came a flood of volumes and the famous pirated edition of Britannica which Henry Allen and his associates published in 1886. Another of Hurst's popular successes was his "Cameo Edition," containing, as he said, "all the Best Works of the Great Poets." Prospective purchasers were told in advertisements that they were getting books "tastefully printed and bound in the best English cloth," but in fact they got badly printed, indifferently bound books printed on the cheapest paper. Even among the reprinters, Hurst did not stand out as a bookmaker. Hurst was another Lovell acquisition in 1890. He leased his plates to the United States Book Co. on a royalty basis, and when it failed, they reverted to him, and he resumed publishing on his own. (Tebbel). Shove also has three pages on Hurst; see Research Tools. From The Publisher's Weekly, 105:p432 (February 9, 1924): THOMAS D. HURST, founder of the firm of Hurst & Company, died at his home in Brooklyn, February 2nd, in his eighty-first year. He was born in England in 1843. In his early business life he was an electrotyper, having established the business which he eventually sold to F.A. Ringlet, one of his employees. In 1871, he started as a publisher and bookseller in Nassau Street, specializing in cheap editions of standard works of which he was one of the pioneers. This line he built up to important dimensions, and when the Lovells, John D. and Frank, formed the Unite States Book Company, he leased his plates as did almost every other publisher of competitive editions to the new corporation on a royalty basis. When this organization failed, Mr. Hurst's plates reverted to their owner, and once again he became an active publisher. He also founded the Argyle Press for the printing and binding of edition work, and this concern did the manufacturing of the famous pirated reprint of the "Encyclopedia Britannica" made by Henry G. Allen and associates. The Argyle Press was finally sold to H. Wolff In 1893. With him his two sons, George D. and Richard, were associated for many years. LUCILE’s ISSUED BY Hurst & Company: Hurst produced 12mo. (about 5x7.5" in size), 16mo., and one 18mo. (both about 4x6" in size) editions of Lucile in many series. His editions of Meredith's Poetical Works (containing Lucile) were, with one exception, in 12mo. format. These editions are indexed on this page first by format, and second by kind of covering material. 1902 United States Catalog. Lucile. 30c, 35c, 50c, $1, $1.50, $2. 1902 United States Catalog. Poems. $1.40, $1; 50c. 1912 United States Catalog. Lucile. 35c; 50c; 75c; $1; hf. lea. 60c; lea. $1; $1.25; $1.50; $2; $2.25. Poems. 50c, lea. $1.25. The catalog of Hurst's 12mos. The catalog of 16mo./18mo. editions: Hurst's small formats. For descriptions and reported copies, go to Hurst 12mos. CLOTH: Argyle Series, 1896-1897; Arlington Edition, 1883-1889, 1892; Avon Edition of the Poets, 1900-1901; Canterbury Edition of the Poets (white art cloth, lithographic inlay), 1906-1913; Floral Edition of the Poets (cloth, floral inlays, jacket), 1909-1913; New Floral Edition (cloth, delicate inlay, jacket), 1914-1915; Medallion Edition of the Poets (12mo, cloth, lithographic medallion of author), 1908; New Argyle Series (12mo, cloth, sides worked in colored inks), 1898-1907; Plain Edition of the Poets (12mo, cloth), 1895-1903; Plain Edition of the Poets (12mo, cloth, lithographic medallion of author), 1905-1907; Red Line Edition, 1881-1889, 1892, 1896-1899. RUSSIA LEATHER: Red Line Edition, Russia, 1885-1886; Red Line Edition, Half Russia, 1887-1889; Companion Books (small 12mo, bookcraft leather), 1918-1919. PADDED LEATHER: Alligator Poets (padded Alligator, titles gold), 1912-1915, 1917; Cathedral Edition of Padded Poets (padded leather), 1910-1912; Florentine Edition of Padded Poets (tints of leather, imitating autumn leaves in natural colors), 1908-1913; Padded Edition of the Poets (embossed padded leather), 1895-1903, 1905-1907; Padded Edition of the Poets (embossed padded leather of new design), 1908-1913; Padded Poets (cross-grain leather), 1917; Premier Edition of Padded Poets (extra heavy grain leather), 1907; University Edition of Padded Poets (padded leather), 1909-1913. LIMP LEATHER: Burnt Leather Edition of the Poets (ooze calf, designs painted by hand, titles burnt), 1904-1913; Flexible Circuit Edition of the Poets (French morocco, Divinity Circuit style), 1902-1903; Hand Painted Edition of the Poets (limp burnt grained leather, hand-painted floral designs), 1908-1909; Ooze Calf Classics, 1917; Ooze Leather Edition of the Poets (ooze leather, title burnt, embellished with hand painted floral designs), 1905. For descriptions and reported copies, go to Hurst 16mos. CLOTH: Ansonia Classics (cloth, lithographic panel inlay in ten colors), 1909-1912; Cambridge Classics (cloth, stamped in white leaf, medallion portraits), 1896-1902-1907; Fleur de Lis Classics (cloth, gilt side and back embellished with floral designs), 1906; Halcyon Classics (white vellum cloth with medallions of delicate flowers on a silver background), 1906; Half Bound Classics (half cloth), 1917-1918; Knickerbocker Classics (16mo, cloth, lithographic panel, white stamping), 1907-1915, 1917-1918; Laurelhurst Series (16mo, half vellum cloth stamped silver, floral sides), 1899-1906; One Million Series ("Every title has sold over 1,000,000 Copies"; tall 16mo, three colors of cloth, ink and gold stamping, tinted papers), 1914-1915; Poetical Classics (16mo, cloth, white stamping, inlaid lithographic portrait of author), 1907-1912; Primrose Classics (Tall 16mo, cloth, floral inlay), 1914-1915. PADDED LEATHER: Alligator Classics (alligator cover, gold titles), 1911-1915, 1917; Burnt Leather Classics (ooze calf, floral and scenic designs painted by hand, titles burnt), 1904-1907, 1909-1913; Calumet Padded Classics (padded covers), 1909-1913; Crushed Levant Classics (Crushed Levant, padded), 1913-1914; Ideal Series of Standard Classics (padded morocco, floral design), 1902-1907, 1909-1913; Ooze Leather Classics (padded burnt leather, hand-painted designs), 1905; Premier Classics of Select Literature (padded leather), 1907; Tuxedo Classics (cross grain padded leather), 1917-1918; Venetian Classics of Select Literature (padded leather), 1908-1913; Westminister Classics (Alligator grained padded leather), 1910-1911. Description and reported copies are included in Hurst 16mos file: See Popular Classics, 1883-1884. 1919: 1 16mo = 1.